The impressive throne bears two satyrs, one young, the other old, who recline against a block containing a compass complete with its glass and magnetic needle. The suspension ring is mounted onto the block by means of an elaborate system. The limb has a double division, both into four 90? quadrants and for the hours I to XII, repeated twice. The rete displays 54 stars, by means of protruding points accompanied by their names. The zodiac circle is marked with the names of the signs in Latin, accompanied by the relevant symbols and the numbers I to XII (with Aries at I). 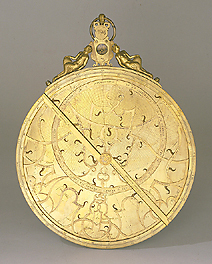 The pointer crosses the entire face of the astrolabe and is divided by the pivot into two parts: one part is graduated 10 to 20 with the inscription: 'Declinatio: Meridionalis', the second part is graduated 10 to 80, with the inscription 'Declinatio Septentrionalis'. The pivot is flattened and decorated with a stylised engraving. The back of the instrument has its limb divided into four 90? quadrants, as well as the names of the signs of the zodiac in Latin, accompanied by their symbols, and by the numbers I to XII (Aries at I), 12 divisions into 30 ('IANVARIVS' at I), and, within each month, by the names of saints corresponding to certain days. The central region is divided by the diameter into two parts - upper and lower. The upper part is traversed by the hour lines numbered twice from 1 to 12 and delimited, in the upper part, by a semi-circle numbered from 1 to 12. Above the lines are the following indications: on the left: 'Hora ante meridiem Hore aequales', on the right: 'Hore post meridiem Hore aequales'. The lower part bears the half shadow square with a double graduation from 0 to 60 and 1 to 12, and the inscriptions 'UMBRA RECT' and 'UMBRA VERSA'. Underneath the half square the following signature can be read: 'Gualterus Arsenius nepos Gemmae Frisij Louuanij fecit anno 1572'. The mater contains 10 plates for latitudes 23 and 26, 29 and 32, 35 and 38, 40 and 41, 42 and 43, 44 and 45, 46 and 47, 50 and 51, 53 and 56, and 58 and 60 degrees. Unusually, the plates have been placed upside-down. See M. L. Bonelli (ed. ), Catalogo degli strumenti del Museo di Storia della Scienza, Firenze, (Florence, 1954), pp. 59-61 and M. Miniati, Museo di Storia della scienza: Catalago (Florence, 1991), p. 34.